The New Haven, CT JCC will hold a reception on June 6th, 5pm for its exhibit of Dora Reym’s oil paintings, watercolors, and charcoal drawings, A Survivor Remembers… and Imagines. The exhibition is now open and runs until July 2nd 2012. Dora Reym, 97 years old and a resident of Hamden CT was a participant in this year’s “Adopt a Survivor” Program. As a young woman, Dora Reym survived two winters in the Auschwitz death camp. In her 60s she taught herself to paint and draw. The 74 pictures in the exhibit tell a moving and inspiring story. The narrative begins with scenes of Jewish life in pre-war Poland as well as charcoal drawings of family members who perished in the Holocaust and it progresses to portraits, landscapes and still life paintings in oil and watercolor that depict life reclaimed and re-imagined. The reception takes place at 5pm and will be followed at 7pm by a screening of the prize-winning documentary, Diamonds in the Snow, which includes an interview with Dora Reym as well as some of her artwork. The film has been shown on PBS as well as in Europe, Mexico and China. 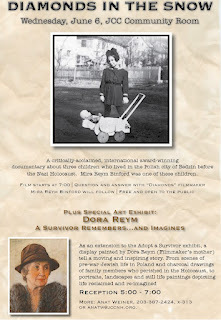 It was made by Dora Reym’s daughter Mira Reym Binford, a filmmaker and Quinnipiac University Professor Emerita. A Q&A with the filmmaker will follow. Diamonds in the Snow tells of three women who as children were rescued from the Nazis, and of the strangers who risked their own lives to save them. Focusing on Bedzin, Poland – a town close to Auschwitz – the film also tells the story of the destruction of a vibrant Jewish community. Dora Reym (originally Dora Pacht Rembiszewska, from Bedzin, Poland), now 97 years old and living in Hamden CT, did not begin painting until she was in her 60s. She taught herself to draw and paint by studying art books and reproductions and copying them, and taking a few classes in life drawing. Although she had never suspected she had artistic talent, she does remember as a child having a special love of color and pattern, and later making photo albums she covered with English linen on which she painted landscapes and roses. And she always had “a good eye”… in the snows of Auschwitz she once caught sight of a diamond, which she traded for a piece of bread. Dora survived two winters in Auschwitz. She was reunited with her husband Mark and their daughter Mira, and after four years of waiting in Germany, they were finally allowed to immigrate to the United States in 1949. Living in New York, for the first ten years she worked long hours in factories, doing piecework until she was promoted to forelady. When she began painting, she experimented with various media including oil paint, watercolor, gouache, pencil, and charcoal. She worked daily and intensively – she would lay down a tarp near a window, put up her easel, and paint all day… and when dinnertime neared, she would clean her brushes, roll up the tarp, pack all her materials into a closet, and by the time Mark came home from work, dinner was ready. She and Mark were a team. He prepared her canvases, framed the paintings and drawings, numbered and photographed them, sat patiently for portraits, and above all, loved and supported her work. When he became seriously ill, she devoted herself to his care, and her artwork stopped, never to be resumed. She nurtured a passionate longing for the large family and the way of life lost in the Holocaust, and she poured that longing into nostalgic charcoals of pre-war Jewish life and especially into the portraits of members of her own and her husband’s immediate and extended families, thirty-six of whom were murdered by the Nazis. She has completed a wartime memoir begun a few years before she started painting. Excerpts have been published in the United States and in Mexico and Spain in the journal Letras Libres.